McKinley Morganfield (April 4, 1915 � April 30, 1983), known by his stage name Muddy Waters, was an American blues musician. He is often considered the "father of modern Chicago blues". 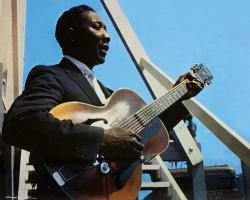 Muddy's influence is tremendous, not just on blues and rhythm and blues but on rock 'n' roll, hard rock, folk, jazz, and country; his use of amplification is often cited as the link between Delta blues and rock 'n' roll.